Northwestern Medicine clinicians are at the forefront in using an advanced surgical treatment called deep brain stimulation to improve quality of life for patients with Parkinson’s and other movement disorders. A gene therapy delivers novel solution for treating serious blood disease. Read the story in Northwestern Medicine magazine. Robert Kalb is moving Northwestern’s Les Turner ALS Center forward. Read the story in Northwestern Medicine magazine. New stretchable electronic patches could transform rehabilitation and long-term care. Read the story in Northwestern Medicine magazine. 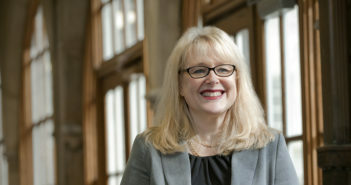 Lori Post, director of Feinberg’s Buehler Center for Health Policy and Economics, takes a high-level approach to protect worldwide victims of abuse, neglect and exploitation. patients achieve healthier lives after leaving the hospital. Northwestern Medicine investigators are developing better treatments and care for patients with the most prevalent of diseases. Read the feature in Northwestern Medicine magazine. New chair Daniel Brat, MD, PhD, is spearheading transformations in pathology, a field that’s rapidly evolving in parallel with advances in precision medicine and a trend toward sub-specialization. Physicians and scientists in the Lurie Cancer Center’s OncoSET program are teaming up to help pioneer precision oncology.